We know the genesis of the story. 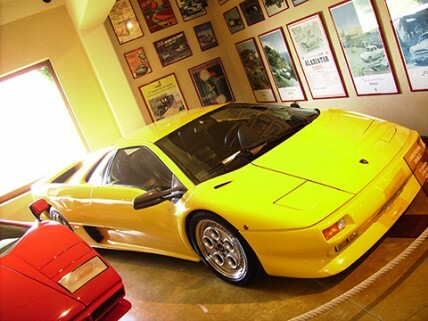 Having been rebuffed by Enzo Ferrari as he regretted the imperfections of the GT purchased in Maranello, Ferruccio Lamborghini vowed to do better than his compatriot. The construction of agricultural tractors or heating devices did not predispose the company to produce luxury cars. But born under the sign of Taurus, Ferruccio Lamborghini persisted. Time to build a factory, and at the Turin Salon in 1963, the public discovers what will be 4 months later the first Lambo. The first 350 GT on drawing by F. Scaglione, edited by Frua, naturally exhibited a V-12 on which had worked G. Bizzarini, former Ferrariste. But in 1966, with additional 512 cm3, the V 12 reaches beyond the 312 horses. And so that its objectives be clearly defined, this engine is equipped with a 2 + 2 and comes in direct rivalry with the Ferrari 330. At the Salon of Turin l965, large crowd on the Lamborghini stand and especially around a bare chassis, Reference 400 TR. Experts infer that this is the V 12-4 L, mounted in”cross posterior” position, i.e. parallel to the back of the two seats. While discussing the omens, Bertone and Marcello Gandini work towards what will become in Geneva, in March 66, the first and fantastic Miura P400. A fighting bull has once again provided the surname. In seven years, 765 Miura (power ranging from 350 to 370 horsepower) Type S or SV (385ch) will bear the palpable and audible trace of true Latin genius. Au Salon de Turin l965, gros attroupement sur le stand Lamborghini et plus spécialement autour d’un châssis nu, référence 400 TR. Les spécialistes en déduisent qu’il s’agit du V 12 – 4 L, monté en position « transversale posteriore », c’est-à-dire parallèle aux dossiers des deux sièges. Pendant que les augures discutent, Bertone et Marcello Gandini travaillent à ce qui, à Genève, en Mars 66, sera la première et fantastique Miura P400. Un taureau de combat a encore fourni le patronyme. 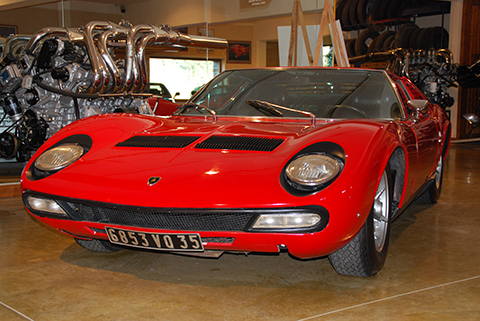 En 7 années, 765 Miura (puissance variant de 350 à 370 chevaux) Type S voire SV (385ch) porteront la trace palpable et sonore du vrai génie latin.